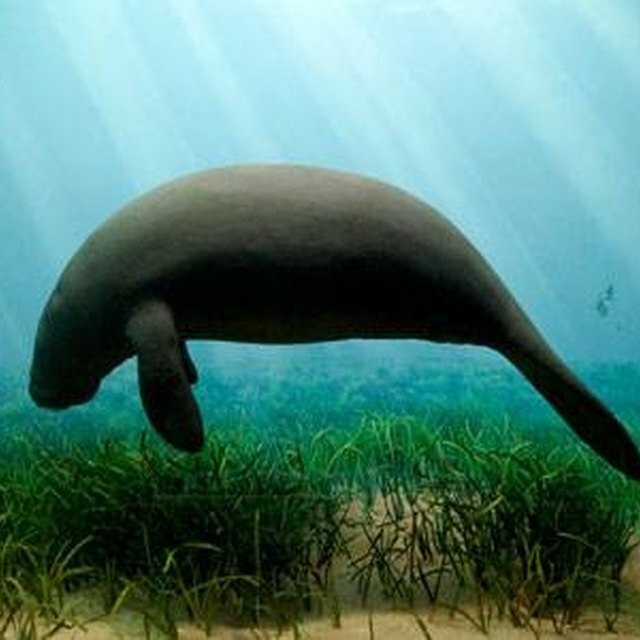 Manatees are vegetarians that survive by eating seaweed in shallow waters in harbors, lagoons and estuaries. When they are resting, they float on top of the water. When a mother manatee nurses her baby, she holds the baby to her breast with her front flippers and uses her paddle shaped tail to steer. Manatees have delicious red meat and they also produce a sweet oil. Humans used to hunt manatees for their meat and oil. Now, the manatees worst enemies are crocodiles, alligators, sharks and killer whales. These predators sneak up on unsuspecting manatees while they are feeding under the water. Manatees do not have claws or sharp teeth so if they are attacked by one of these animals, they are in trouble. They do not travel in large herds so the others cannot help to warn or protect a manatee from attack. Their only real protection strategy is to remain in very shallow water. This way, if they are attacked, it is less likely that the predator can drag them under the water for longer than the 15 minutes that the manatee can survive without breathing. Manatees protect themselves by avoiding trouble. Barker, Lesley. "How Do Manatees Protect Themselves?" Sciencing, https://sciencing.com/manatees-protect-themselves-4567408.html. 24 April 2017.